It wasn’t all that long ago when analog CCTV systems were hailed as an innovative breakthrough finally offering businesses the peace of mind they were looking for. However, now a modern surveillance cameras company would most likely call analog technology obsolete. Rather, the new industry standard is shifting towards Network IP Surveillance Systems. There are many different reasons that a company might decide to upgrade their old system with Network IP Surveillance Cameras. For one, IP Cameras have much higher resolution. They are also more effective, scalable, and accessible than their counterparts. Be sure to read our previous article covering the differences between Analog CCTV and Network IP Systems first if you’re unfamiliar with different technologies. Continue checking out some more of the primary benefits listed below and find out just why Network IP Surveillance Cameras might be right for securing your company. The first and foremost obvious advantage of having Network IP Cameras over analog is that they offer superior details. The ability to digitize images inside the cameras before sending data to be processed makes the image quality significantly higher than analog CCTV footage. On top of that, their field of view is also wider. Plus, they allow users to actually zoom in on footage while remaining clear and useable. Long gone are the days of grainy, useless footage. Now you can actually capture video surveillance that allows your personnel or law enforcement to identify the suspect for apprehension. Having more overall coverage also can reduce the overall number of surveillance cameras your company will need to add to the system. This can help you save money on upgrading your system or even out the cost differential since Network IP cameras do tend to be more expensive than older security devices. Another cost-saving advantage is the fact that you won’t need to pay as much for installation. The infrastructure of having less devices and cabling can save you from paying more on equipment and man hours to the company installing the surveillance cameras. Network IP systems also require a lot less work to maintain over time. Many analog security camera systems still use tape recorders for video storage. Obviously, that creates complications with accessing the footage while limiting the total amount of video storage available. Even analog systems that use a DVR are limited in their ports and placement options since they have to be directly connected to the camera. Network IP Systems, on the other hand, are connected and powered through a single Ethernet Cat 5/6 cable that connects to a port. This greatly improves the areas you can put the cameras while enabling you and any of your security personnel to access the footage remotely from any device connected to the internet. One of the most desirable features that upgrading from old analog surveillance systems offers is remote monitoring. 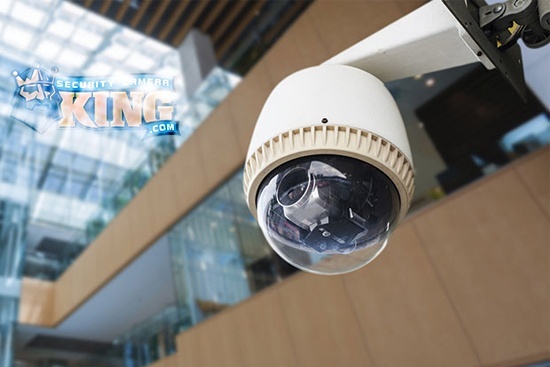 With remote monitoring, you are able to access archived footage and view live feeds of the company through any connected surveillance cameras. Moreover, Network IP cameras have built-in encryption, increasing their security by reducing potential hacking attempts. Another recent development to consider is having a professional surveillance cameras company provide remote monitoring for your business. Remote monitoring services are the equivalent of having a professional security guard protecting your employees and assets 24/7, but for an actually affordable cost. As previously mentioned, Network IP systems are more cost-effective than their older alternative. They don’t need to have nearly as many wires running to each device, don’t have to be directly connected to their NVR, and require less space since digital files can be compressed. Yet, even though fewer cameras are required to achieve total coverage, surveillance needs often change as businesses grow. The advantage of using CAT-5/6 wiring and Power-Over-Ethernet (POE) technology further improves your ability to add to the system. Because the surveillance cameras only have to be connected to a POE switch, the system is as scalable as you need it to be and easily adaptable with changing surveillance needs. The most innovative advantages that new IP surveillance systems have over outdated CCTV systems involve other new surveillance technologies. The upgrades to the management software that a Network Video Recorder runs on enable users to continuously incorporate technological advancements as they are released. Intelligent Analytics is one of these advancements. It allows you to receive alerts when any camera detects things like motion, scene change, or missing object while also improving the ability to search through all the recorded footage. Some are capable of facial recognition, thermal imaging, and many other useful features. Given the above points, it’s obvious why a company would consider upgrading surveillance cameras to incorporate newer technologies. Network IP systems provide many advantages over their analog counterparts. In the coming years, it would be reasonable to assume analog CCTV technology will slowly fade away as it becomes more and more obsolete. Interested in learning more? Consult a security camera expert about putting together a custom video surveillance solution capable of handling your needs.